Another unjust steward convicted of crimes in Northeast Florida. How arrogant to tape record a telephone conversation when permission was DENIED to Flagler County Supervisor of Elections KIMBERLE WEEKS. As Bill Clinton said in his Second Inaugural Address, "Nothing great was ever accomplished by being small." It appears WEEKS was petty and small-minded. Just the sort of egotistical person we do not need in public office. (Photo: Flagler Live). Kudos to Seventh Circuit State's Attorney Ralph Joseph Larizza for bring this successful prosecution of white collar crime in the Flagler County Courthouse. What's next? Prosecution of Sheriff DAVID SHOAR in St. Johns County? Yes, we can! 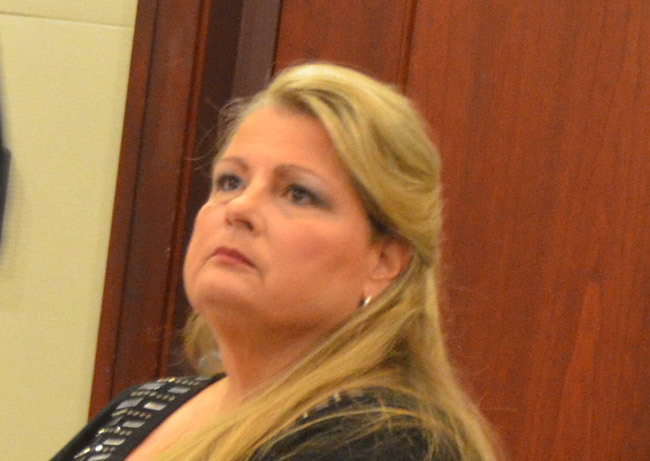 BUNNELL — Former Flagler County elections supervisor Kimberle Weeks was sentenced Friday to 18 months of probation, with the first 30 days to be spent in jail. But Weeks spent little more than an hour at the Flagler County jail from where she was released at 4:12 p.m. Friday. Her attorney, Kevin Kulik, convinced the judge to allow Weeks to remain free on $25,000 bail pending appeal of her seven felony convictions for illegally recording conversations, including a telephone conversation with the Florida Secretary of State, who asked for jail time. Before handing down her sentence, Circuit Judge Margaret Hudson asked Weeks if she wanted to say anything. Those were the only words she spoke during Friday’s hearing other than talking to her attorney. In allowing Weeks to remain free while she appeals, Hudson noted that there are legitimate issues to appeal. The case involves crimes committed in a digital age prosecuted with laws from an analog era. Hudson also ordered Weeks to pay $2,871 for the costs of the investigation, far less than the $33,000 that Assistant State Attorney Jason Lewis had requested, which would have included the wages of employees involved in the investigation. Weeks’ attorney, Kevin Kulik, argued that it was rare to charge such hourly wages in a criminal case and in the end the judge did not. Based on state sentencing guidelines, Hudson could only sentence Weeks to prison after making a special written finding that Weeks would present a danger to the public otherwise, Kulik argued in court and in a motion filed Thursday. Weeks, 57, faced up to five years in prison on each of the charges, which are all third-degree felonies. In seeking jail time for Weeks, prosecutor Lewis argued that she ignored the law and derided and mocked the people she recorded illegally. He said as a public official, Weeks should be held to a higher standard. He told the judge that some of her victims felt she should get jail time. That included Florida Secretary of State Ken Detzner and Gary Holland, assistant general counsel for Florida Department of State. Holland was assistant director of the division of elections for the Florida Department of State when Weeks committed the crimes. Lewis read from an affidavit from Detzner and Holland in which they said Weeks deserved time behind bars. Palm Coast City Clerk Virginia Smith testified and asked the judge to hand down an appropriate sentence. Although she did not ask for jail or prison time, Smith made clear that she felt Weeks’ crimes were serious. Smith said Weeks’ crimes took a toll on the community. Kulik, a Fort Lauderdale attorney, questioned the impact of Weeks’ actions on the community. He said the case had been devastating to Weeks. He said Weeks has five children and numerous grandchildren who care for her and don’t see her as this criminal deserving of jail time. He said that since she left office, Weeks now primarily cares for an 81-year-old man who was a friend of her father’s. He said she is not paid for the tasks but does it to help him. Weeks was indicted in May 2015 and arrested, originally on 12 charges. But her attorneys fought successfully to knock some of those off. During the trial, prosecutors painted Weeks as an egotistical elections chief who began making the illegal recordings of public officials after she felt disrespected and got some bad press. They said her intent was to protect her image. Weeks’ attorneys countered that she had detected ethical violations involving local officials and possible voter suppression, and she was trying to bring it to the attention of state authorities. Weeks had asked Detzner for permission to record him during an April 2014 phone conversation. Detzner declined but Weeks recorded him anyway and later told some people she wasn’t sure what she had done was legal. At the time, Weeks was feuding with Palm Coast officials over polling sites. Detzner urged Weeks to resolve the dispute with the city. Weeks shot back at Detzner, telling him his letter was inappropriate and gave her a “black mark” in the media. Lewis said at the sentencing hearing that Weeks believed she was above the law. “Her conduct reflects a complete lack of respect for the law,” Lewis said.